A new range of “bread beds” is taking Japan by storm. The latest offering from Japan, which have a predilection for wacky home furnishings, is a quirky collection of bedding inspired by baked goods. So you can lay your weary head on a square toast pillow, tuck yourself into a croissant sleeping bag, snuggle up inside a doughnut and even wrap yourself in an omelet. The good-enough-to-eat range of soft furnishings is being sold by Felissimo, and each piece is priced at ¥16,800 ($173). Brian Ashcraft of Kotaku translated some of the names of the items in the range from Japanese to English. The sleeping bag that looks like a creme horn or croissant roughly means “flop down in a chocolate nap”. The original Japanese name merges the words Korone (コロネ), this dessert’s name in Japanese, and the word Gorone (ごろ寝), which means “napping”, reported Kotaku. The toast set’s name is translated to “thick slices of Japanese cushion bread”. It comes “served” with a red blanket that is meant to look like jam. The bread and jam set also work as a makeshift bed. A thick, round, “glazed” sleeping bag is sliced in the middle to resemble a doughnut, and allows the owner to tuck in as its “cream”. The name is, roughly, “cream pocket bread”. A circular beige sleeping bag which comes with a green blanket is dubbed the “goodnight dessert omelet”. It rolls around you and fastens, or rolls out flat and circular. The blanket resembles the “green tea cream” accompaniment. 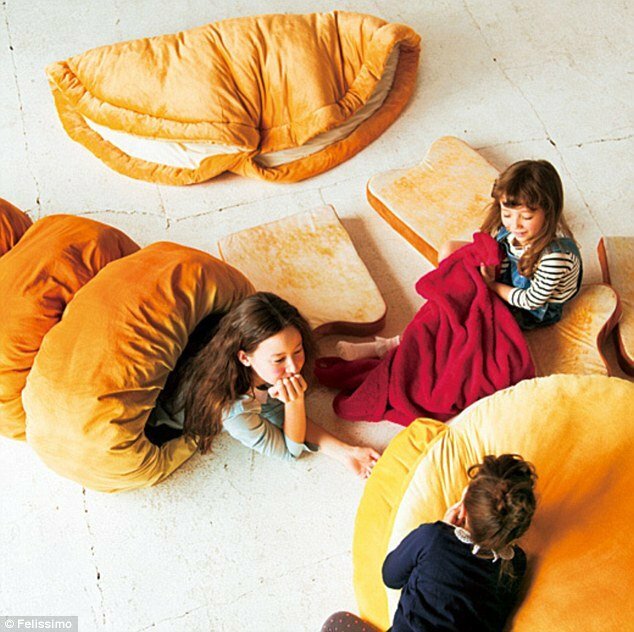 Many users in Japan say they are desperate to get hold of their own sweet-looking bread bed to lounge around in.